It seems club programmes in the SPL might be about to endure a rather brutal re-invention. The league, in its new found spirit of consultation, is canvassing opinion on the future of individual club programmes. The endgame might see the disappearance of programmes as we know them and the advent of a league-wide SPL matchday magazine. To which I say: "Meh." "The clubs have been talking about this issue for the last 18 months or so. "We’re very much in the camp of regretfully wanting to scrap them. "It probably takes up two full days of my working week and it’s just impossible to justify that now. "Sales of the programmes are dreadful, and from speaking to colleagues amongst the other clubs, I know it’s the same across the board." With club websites offering behind the scenes access and competing with hundreds of online football outlets the matchday programme might be anachronistic. Yet I don't buy the programme - and I do at every game I go to - to read about games happening elsewhere. There's a risk, perhaps, of the SPL looking at supporters as a homogeneous consumer group. We're not. And we don't have any affinity to the SPL brand. If there was a market for a one-size-fits-all SPL magazine it would probably be available in newsagents and supermarkets. Supporters who are already paying princely sums to watch games and enjoy bad pies don't necessarily represent a receptive captive market for an SPL magazine. Even one with Neil Doncaster on page three. But it seems the humble programme - a football fixture since the 1880s - is under threat. Unless the fans vote to keep things as they are. And the SPL chooses to listen to its customers. A footballing tradition threatened? 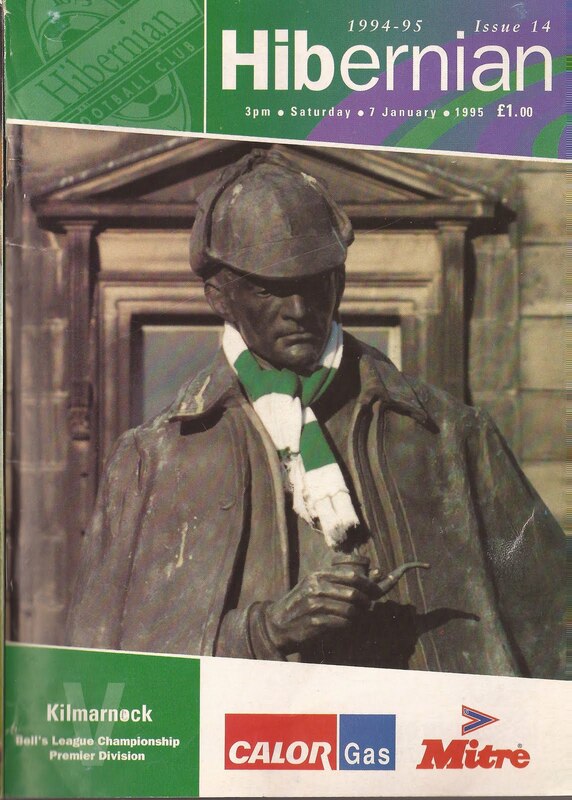 Time to wallow in some nostalgia with a scattergun tour of the evolution of Hibs' programme over the last 50 or so years. September 1959. Britons, they'd been told by a paternalistic Prime Minister a couple of years earlier, had never had it so good. But Lady Chatterley's Lover was still kept well away from wives and servants, The Beatles were still The Quarrymen and Philip Larkin had time on his hands. A certain austerity cast a shadow over Hibernian Football Club's official programme. The visit of Kilmarnock on 26 September saw Hibs hail a returning hero as Bobby Johnstone made his return to Easter Road. Johnstone had been part of Hibs' lauded Famous Five forward line before moving down south where, with Manchester City, he became the first player to score in consecutive FA Cup finals. His return, at the age of 30, would help propel Joe Baker to 42 goals in 33 league games that season. But the programme took a decidedly low key approach to the prodigal. Hugh Shaw manages to fit in one sentence of welcome in the third paragraph of his rather taciturn manager's notes. Page three's 'Touchline Topics' starts off rather more enthusiastically ("Welcome back Bobby Johnstone!") before dwelling slightly too long on the disappointment of the 8000 fans who turned out for a midweek reserve game only to find that Johnstone wouldn't be playing. The news that Willie Ormond had backed five winners out of six at Musselburgh Races and would probably invest in a new pair of bowls with the proceeds is treated more joyously. The programme, black and white with the odd splash of green, stretches to eight pages. There are 15 adverts although none of them over a full page. The Pink News ("For Best Reports On All Sports"), the Green Dispatch, Drybrough's Export, King George IV whisky, Senior Service cigarettes ("Satisfy) and weekend excursions to the Blackpool illuminations are all featured. And, lest you'd been jigging on the terracing, it's noted that "all Gramophone Records played prior to the start and during the interval can be obtained from BANDPARTS, 9 Union Place, Edinburgh." The programme cost 3 pennies. I'd reckon that would be around 20p in today's money. 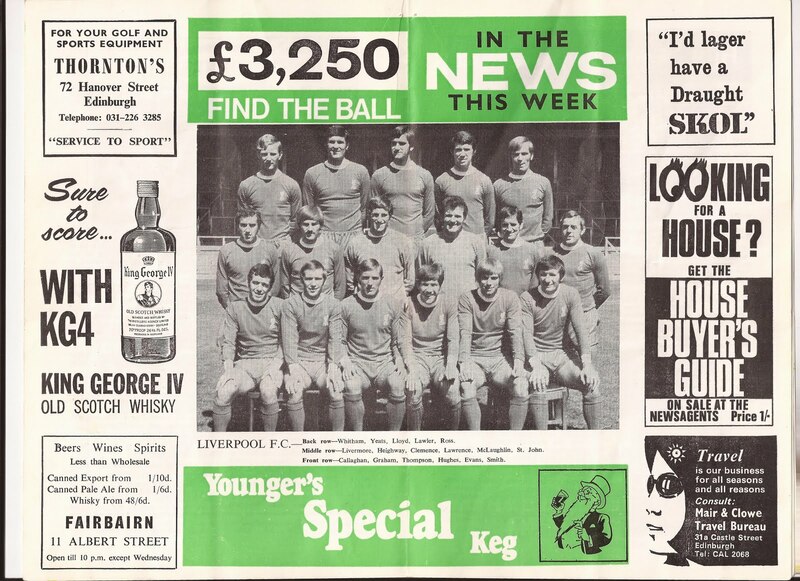 Jumping forward to 1970 and the programme went all out to impress Liverpool, Hibs' Fairs Cup opponents. It did this, still in black, white and a bit of green, by devoting much of the content to the visitors. An article on page three with the headline 'Seven Titles And They Top The Lot' sets the tone. 'Question Time with Bill Shankly' - "they've suffered me in England for 30 years" - follows on page seven while the centre spread is devoted to a picture of the Liverpool squad. An indepth two page look at the Anfield squad includes profiles of 'Six Figure Stars' Alun Evans (injured for this game) and John Toshack. In eleven years the programme had grown to 16 pages with 17 adverts. Texaco's Grandstand football books (5 shillings or 25p each), the Renault 12 and the Scottish Daily Express get full page ads. Gramophone records featured at the game were still available from BANDPARTS, while the Parachute Regiment was looking for people to join up in their "spare time." All this cost one shilling, I'd reckon that to be about 80p today. By 1970 The Beatles had imploded and the promise of the white of heat of revolution was about to forge the end of the post war consensus amid strife, rancour and discontent. "I should mention at this point that we had a very good travelling support at Falkirk recently. We were a little disturbed, though, to find that a few fans landed in a spot of bother. Hibs expect their supporters to behave in exemplary fashion." "Football moves nervously into the 80s with various battles to win before the game in Scotland can be labelled healthy again. A decline in standards and an upsurge in hooliganism have been the major factors in the fall of attendance figures. "The reduction in spectators makes it tougher for even the top outfits to balance the books without accepting cash from the transfer market and now the emphasis in every club is placed on a thriving lottery. "More sponsorship is coming into the game and there will be further changes in the next ten years." For Hibs and football there would be a lot of pain still to come. A new generation - Thatcher's Children - were being welcomed into the world. 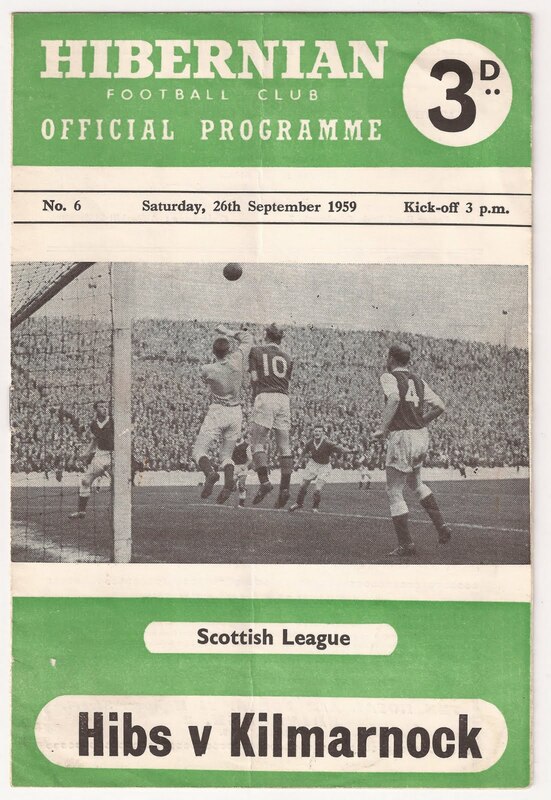 This Celtic game was the first match Hibs played after I was born. Times were changing. In handbagging society into submission, Thatcherism would both alienate football and, unwittingly, lay the foundations for a capitalist footballing boom that would have leave some rich and others trailing in their wake. All that was still to come. The programme, clinging to the black, white and green palette, remained at 16 pages. 19 adverts were included with Bukta and Hibs' own lottery taking full page ads. In 'Eddie Turnbull's Talk' - an incongruous smile in the accompanying photo belying that this was a season that would see Eddie leave and Hibs get relegated - the manager noted that "we were all glad to see the end of 1979." 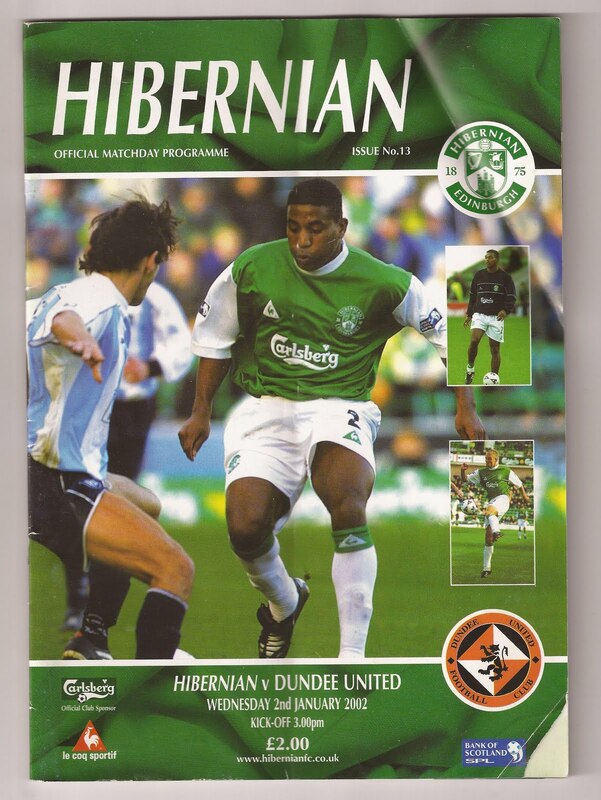 It seems that the Hibernian matchday experience hasn't always been joyfully embraced by the official programme. 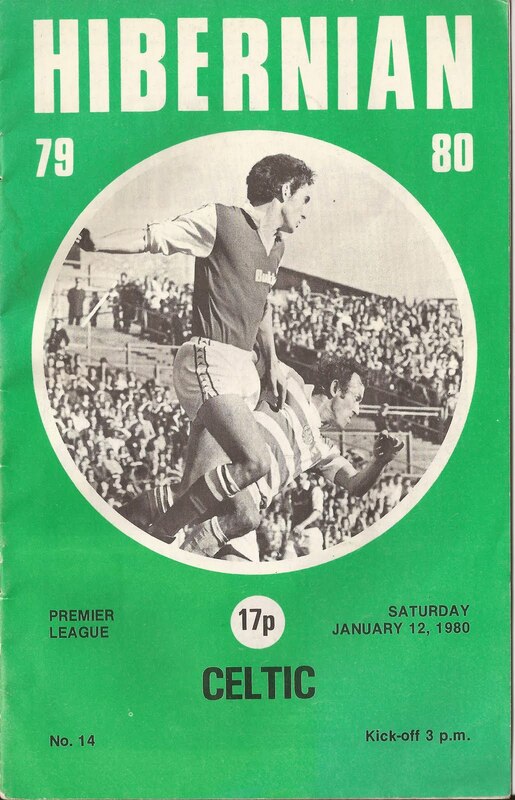 The 1980 programme cost 17p, probably somewhere in the region of 60p in 2011. What had a further six years of the have-it-all 1980s done to the offical programme experience? 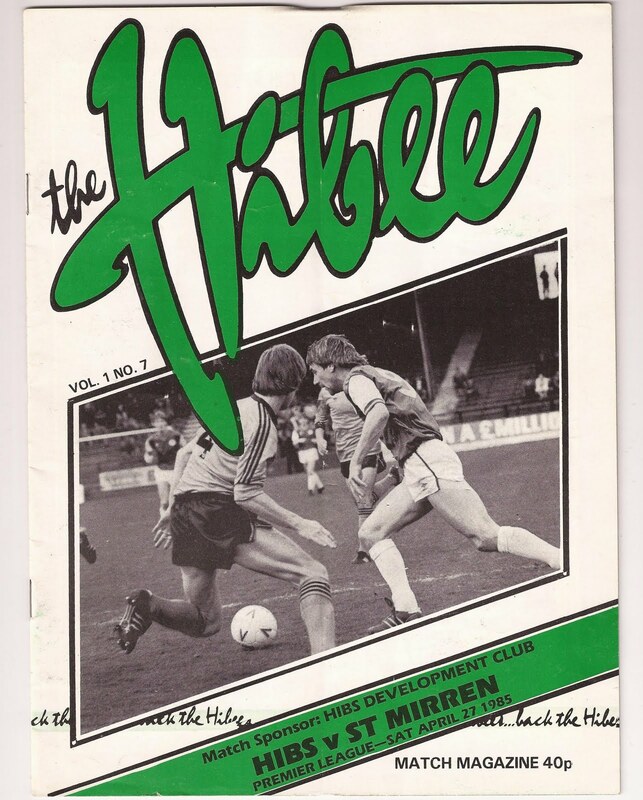 A new name - The Hibee - and a much jazzier look marked 1986's 18 pages as a more sophisticated publication. 19 adverts include a full back cover ad for the first time. This being the 80s that advert is for an estate agency offering free mortgage advice and "up to 100% mortgages." A letters page has been introduced, there are a couple of brief nostalgia features and captain Tommy Craig has a column of his own. We're even treated to a picture of Hibs fan Derek Milligan receiving the 12 inch Ferguson colour TV he won on the "Hibee World Cup Lottery Ticket." Things are moving on. Player sponsorship information appears for the first time, with the Middle East Branch of the Hibs Supporter's Club sponsoring Ralph Callachan. The Hibee of 1986, priced 40p (about 91p today) is the halfway house of programmes. In its overly busy but earnest pages we can see attempts to commercialise that go beyond placing all your faith in the lottery that seemed such a good bet at the dawn of the nervous 1980s. Like Del Boy falling through the bar the programme was trying hard but not quite pulling off what it wanted to be. Almost a decade on and the programme had more or less matured into the creature we know today. The manager's note remains but we now get an action shot of Alex Miller thrown in. 36 pages include 32 adverts, nine of them across a full page. A tortuous anecdote about perennial backroom fixture Donald Park's misadventure in a toy shop is telling. Here's the precursor of the sort of mind numbing filler all football clubs now like to feed fans in lieu of any real access. Football was, for good or for bad, beginning to learn what it wanted to be. In 1995 Hibs were but a few seasons from another relegation. By 2002 they had bounced back and football had been completely seduced by money. Cash was to prove a cruel mistress but at the start of that that season Hibs were brash and confident. And so was the programme. It was bigger and bolder. And it had Ulises de la Cruz, the club's record signing, on the front cover. He was accompanied by the main sponsor, the kit sponsor and the league sponsor. Those three were joined by another dozen adverts, nine of them luxuriating over full page spreads. 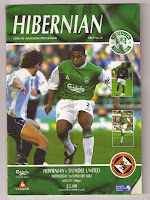 There's actually an impressive amount of information in there, including a review of the 2000-01 season, profiles of each player, Hibs' complete Scottish Cup record since 1946-47 and the story of the 2001-02 season so far. A treasure trove of information for your £2. "I wish for everybody here today a healthy and happy 2002: these are the most important things in life." Happiness was to be in short supply for Franck. Flicking to page 30 and reading '11 Fantastic Facts About Eduardo Hurtado' would give some indication of the troubles ahead. Ulisses de la Cruz and Hurtado. Two signings to illustrate why the optimism of the new millennium was misplaced. And why, once more, Scottish football's finances were about to come crashing down to earth. And so to this season and the opening fixture against Celtic. 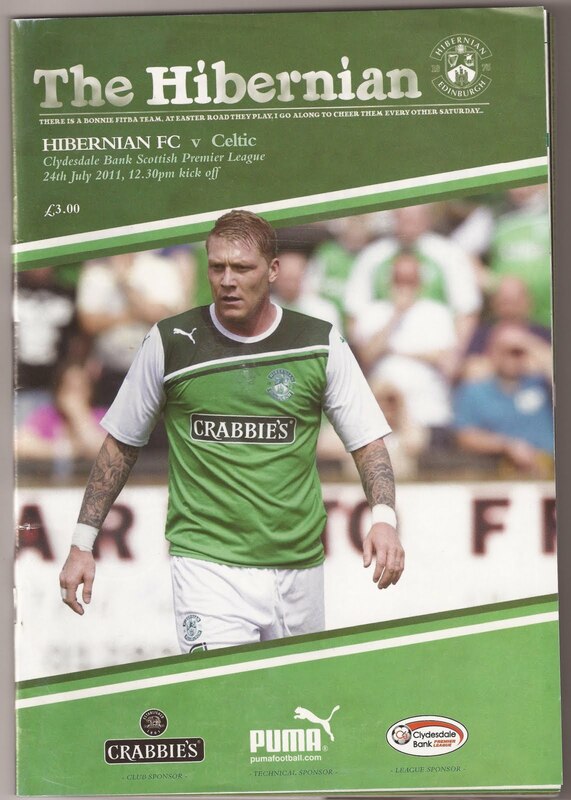 2011's programme, The Hibernian, runs to 64 pages. I counted over 20 adverts but eight of them, including two double page spreads, are for Hibs' own commercial activities. "You need your [sic] evaluate your form after the first segment or quarter of the season - after about 11 games. "This season will be demanding, challenging and, at times, potentially slighly disappointing, but it will also be exciting and we look forward to having you alongside us for the journey." Garry O'Connor gets a three page interview and a centre spread poster. Peter Marinello's story is told across two pages. Hibs' community work, academy news and ladies team are all featured. Hard work has gone into the production of this programme. And it shows. But at £3 you are paying for that effort. That's about a 15 fold price increase in real terms since the austere publication of 1959. Given the other outlets the club now has to connect with the fans, I think there might be a happy medium to find between the programme of over 50 years ago and the blockbuster production of today. If you print it, they will buy it. I'm not sure that's true. If it's not then stop printing quite so much. Do we need 64 pages costing £3? Or would we settle for something cheaper to produce and cheaper to buy? 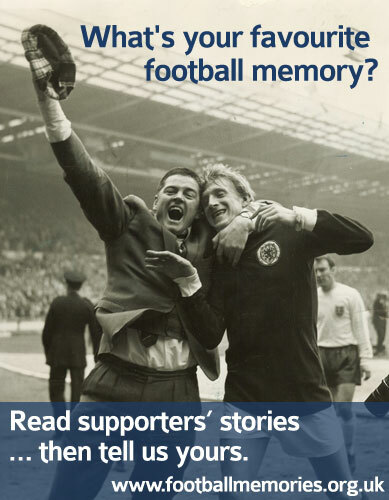 Club programmes offer an alternative history of football clubs and the society and eras they exist in. The SPL is a soulless organisation and a league-wide magazine would reflect that. The fans deserve to hold on to something of their own.